Posted byRevEverett	 May 31, 2012 9 Comments on Why doesn’t Church ask us to Check In? My favorite neighborhood restaurant is Vee Vee. They serve locally-sourced food in a cosy space. They deliver by bicycle. Inside, they’ve added a new sign:. And so I did, posting a photo of my tasty meal. I visit a lot of churches, more churches than restaurants. I’ve yet to see a sign like this in a church. “Checking in” with social media allows us to narrate where we spend our time, talent, and treasure. Every Sunday, we boldly invite our people to give generously to further our common ministry. Post a small sign like this or a note in the bulletin asking the same. 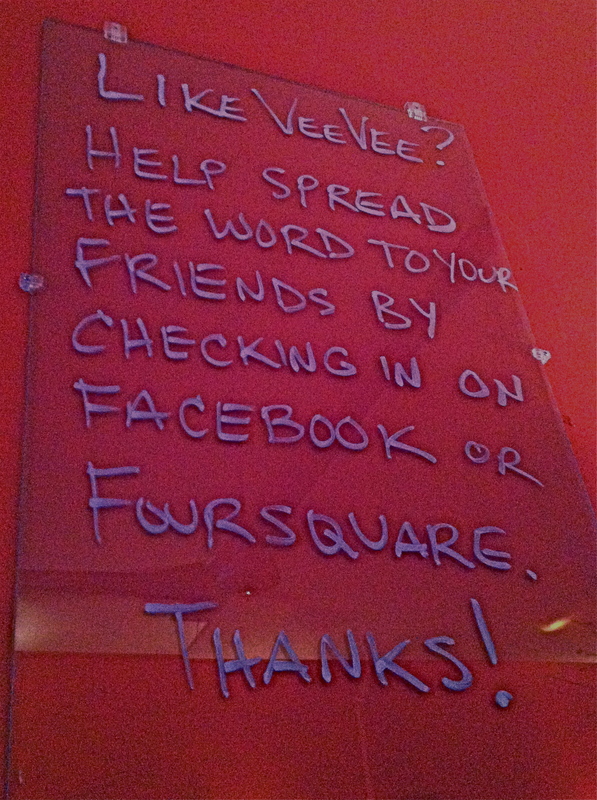 As Vee Vee said, “Help spread the word to your friends.” Invite our people to check in. Agreed, Laura! We’ve written that on our whiteboard at Franklin Federated before – will need to keep at it! Tiffany, that’s great! Love the wipe board. I hope this reads as an affirmation of the good work your church is already doing. And clearly, I haven’t visited Franklin Federated yet. Have you seen other churches asking you to check in? Thanks Keith, your post is outstanding and a great reminder of all the (easy) things we can do. I was struck with how low-key and unabashed Vee Vee was in asking me to check in. Not always, but sometimes church can get so twisted up in asking if it’s too forward or too commercial to ask our people to do things like checking in. With Vee Vee, it seemed so natural and logical- you like our food, why not tell your friends. And I have Foursquare “Check-In” stickers on the door to our office and on a window at the entrance to our sanctuary. Great stuff, Laura. We have a Foursquare decal placed on our window at St. John’s, Lakewood, WA, but we could be much more explicit. Thanks!